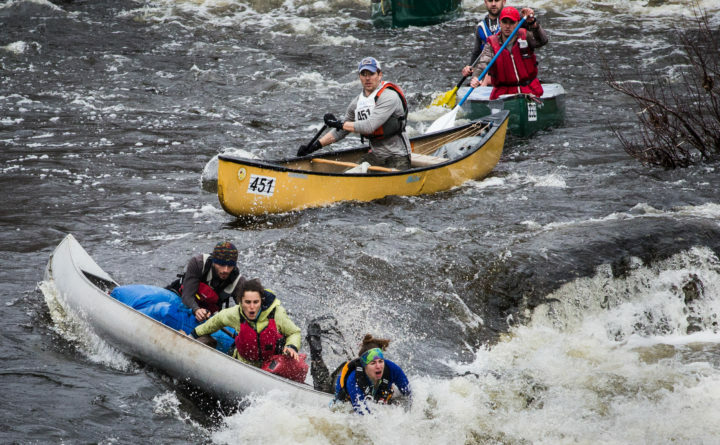 An aluminum canoe goes over at Six Mile Falls in Bangor during the 52nd Kenduskeag Stream Canoe Race in this April 21, 2018, file photo. WATERVILLE — Registration is open for Thomas College’s fifth Dirty Dog Mud Run on Sunday, April 14, at the college. The Thomas College Dirty Dog Mud Run is a 5K, 14-obstacle course that loops through the woods and campus, and will be held on Thomas College’s new campus trail, the Sukeforth Family Trail System. Obstacles include monkey bars; tire flips; mud crawl; bucket carry; 3-, 4- and 5-foot walls; and trails. The new course includes more mud pits, tire drags and a few surprises. Registration is open online. The cost is $45 and is open to everyone. All proceeds support Thomas College student recreation. In the past, the college has purchased exercise bikes, fat-tire mountain bikes and disc golf baskets, and have built an outdoor ice rink. FORT FAIRFIELD — The 33rd Tiger Basketball Camp will be held June 24-28 for girls and July 8-12 for boys at the Fort Fairfield High School gyms. The camps are open to players in grades 1-8 and will be limited to the first 150 applicants. They will run from 8 a.m. to 4:30 p.m. Monday through Friday, and include breakfast and lunch each day with a special barbecue lunch Tuesday. Daily winners of the “Hustle” and “Sharpshooter” contests will receive T-shirts. Each participant will also receive a special Tiger Basketball Camp T-shirt, a camp basketball, and other items including a chance to win Boston Celtics and UMaine basketball tickets and a new portable basketball hoop. The $150 fee includes instruction by a knowledgeable staff of more than 20 coaches, meals, awards, T-shirt and a basketball, and the family barbecue awards ceremony. For more information, contact Larry Gardner at 207-551-5001 or lgardner@msad20.org, or visit Tiger Basketball Camp on Facebook to download an electronic form. PRESQUE ISLE — The Aroostook Basketball Camp for players ages 9-16 will be held June 24-29 for boys and July 8-12 for girls at Presque Isle gymnasiums. Camps are designed to help players develop skills through drills, games and lectures. The coaching staff includes successful high school and college coaches. Camp counselors will be high school and college players who will relate their playing experiences and help with instruction. For more information, contact Bill Casavant at 207-551-5778 or bballump34@yahoo.com, or visit AroostookBasketballCamp on Facebook. KENDUSKEAG — The Bangor Parks and Recreation Department is still accepting registrations for the 53rd Annual Kenduskeag Stream Canoe Race on Saturday, April 20. Fee is $35 per person until April 19 and $50 the day of the race. Race-day registrations are only accepted from 6:30 a.m. to 7:30 a.m at the registration tent in Kenduskeag. Participants must be at least 12, and participants under 16 must have an adult with them in the boat. Registrations can be done online and at the Parks and Recreation office at 647 Main St. For more information, visit www.bangorparksandrec.com or call 207-992-4490. AUBURN — The 11th annual LifeFlight Emergency Care Open will start at 8 a.m. Monday, June 17, at the Martindale Country Club, 527 Beech Hill Road. This is a traditional scramble, with games on the course including the ever-popular air cannon. Pending availability, the LifeFlight helicopter will also make an appearance. Includes food and prizes. BAR HARBOR — Bar Harbor Bank & Trust has announced the 26th annual David R. Harding Memorial Golf Tournament. The event will benefit two Mount Desert Island nonprofits, Bar Harbor Food Pantry and Westside Food Pantry, which share purpose of eliminating food insecurity in their communities. The golf tournament will be played Tuesday, June 4, at Kebo Valley Golf Club. For more information, call Zoe Zalta at Bar Harbor Bank & Trust at 207-667-0660, ext. 10519. BREWER — The Penobscot Ice Arena is offering several league programs this spring and throughout the summer for youth and adults. Summer Youth Hockey, June 17-Aug. 25; Adult A/B League, April 29-Aug. 25; Adult C League, May 1-Sept. 5. For more information, visit penobscoticearena.org or email penobscoticearena@gmail.com. ORONO — The University of Maine is holding the 12th Healthy High races on Saturday, April 27, at the New Balance Recreation Center, Hilltop Road, University of Maine. The 15K starts at 9 a.m. followed by the 5K/10K at 9:30 a.m. The 5K/10K/15K run/walk begins at the rec center and continues on a course around campus ending back at the rec center. The courses will be timed until 1 p.m. The 5K course and the 10K course are certified by USATF. Prizes will go to the top male and female runners in each of the divisions for the 5K/10K/15K. Preregistration by paper goes until April 26. No refunds or transfers for this race.